The UK and France continue to work together to jointly develop a prototype autonomous system for detecting and neutralising sea mines and underwater explosive devices. At Euronaval last week in Paris, the Organisation for Joint Armament Cooperation (OCCAR) confirmed the ongoing cooperation between the two countries to jointly develop future unmanned naval systems. The announcement was welcomed by contractors Thales, BAE Systems and their partner SAAB, ECA Group and ASV Global. Initiated in 2010, the Maritime Mine Counter Measures (MMCM) programme involving the UK Ministry of Defence (MOD) and French Defence Procurement Agency (DGA), will develop a prototype autonomous system for detecting and neutralising sea mines. The next stage of the programme will involve taking the first stage designs into a complete, manufactured system for assessment by the Royal Navy and the French Navy. 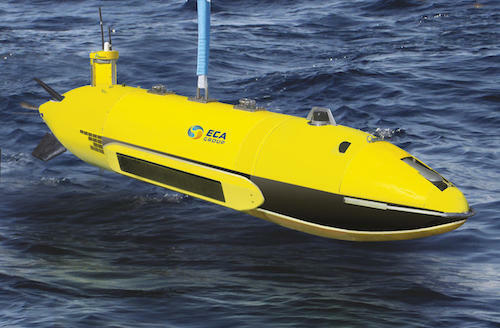 For this crucial next phase of the project, ECA Group says it will supply six autonomous underwater vehicles, as well as a launch and recovery system. With an estimated 400,000 sea mines in the hands of the West's enemies, mine detection and neutralisation is ripe for innovation. Traditional minehunter vessels are slow moving and can only cover small areas at a time. Unmanned systems (in the air, on the surface and below the surface of the water) have the potential to clear larger areas and to keep personnel and vessels out of the danger zone. At the Royal Navy's recent Unmanned Warrior exercise off the west coast of Scotland, ASV Global and Thales showcased the Halcyon unmanned surface vessel's remote mine-hunting capabilities whilst towing a Thales Synthetic Aperture Sonar. At Euronaval in Paris, ECA Group demonstrated its system of robots, including UAVs, that are capable of working together to detect and clear mines both above and below the surface of the water.